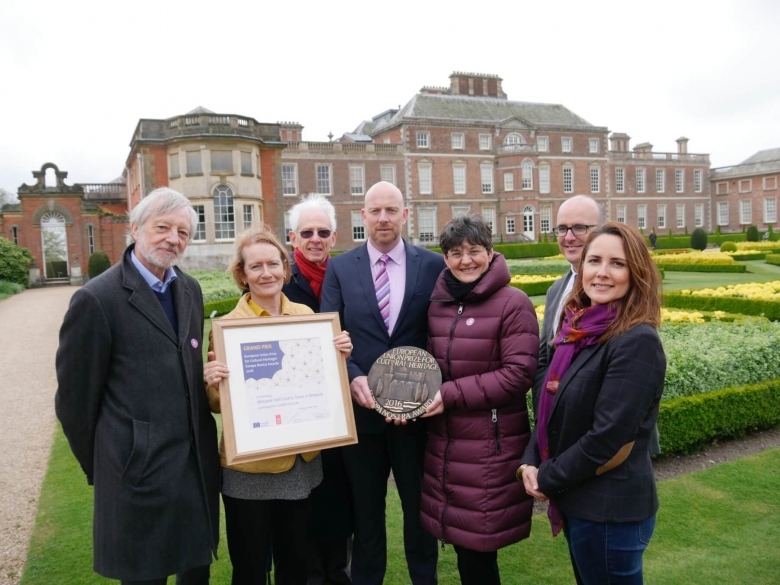 The rehabilitation of Wimpole Hall’s Gothic Tower received a Grand Prix of the EU Prize for Cultural Heritage / Europa Nostra Awards 2016 at a special ceremony held at the Wimpole Estate in Cambridgeshire, United Kingdom, on 20 April 2017. Sneška Quaedvlieg-Mihailovic, Secretary General of Europa Nostra, Dame Helen Ghosh, Director General of the National Trust, and Wendy Monkhouse, Curator from the National Trust, addressed the audience. Many of those involved in the restoration project of the Tower – a superb pseudo-medieval ruin of a castle, based on a sketch by the architect Sanderson Miller in 1749 – participated in the ceremony, from heritage professionals to specialists and contractors, as well as volunteers and supporters. Located in the magnificent parkland of Wimpole Estate, the Gothic Tower presented a complex conservation challenge for the National Trust. The work called for repair of the structure, stabilisation of the stonework and reinstatement of missing components of the building, while preserving the weathered beauty and original ‘ruined’ appearance. The Grand Prix was presented to the National Trust by the Secretary General of Europa Nostra. In her address, Sneška Quaedvlieg-Mihailovic stressed that the relationship between the United Kingdom and Europe has always been strong – as illustrated by the current Grand Tour Exhibition on show in Wimpole Hall, which she had visited prior to the presentation ceremony – and she was sure those links will remain in the future. Dame Helen Ghosh, Director General of the National Trust, praised all those involved in the project who had worked in pursuit of excellence and regretted, in part, that the scaffold was still not around the tower so she could climb to the top and look at the view, just as over one thousand visitors had been able to do during the conservation works. Wendy Monkhouse, Curator from the National Trust, said the success of the project had been achieved by understanding the building and its needs, painstaking research, and meticulous attention to detail, to enable conservation to be undertaken stone by stone. This standard of conservation was made possible by funding managed by Natural England, some special bequests to the National Trust, and the support from National Trust members. Following the ceremony, Sneška Quaedvlieg-Mihailovic, along with a number of other attendees, walked across the parkland to the Gothic Tower itself, to see the conservation of the Gothic Tower at close quarters. Paul Coleman, the National Trust’s Project Manager, Trevor Proudfoot from Cliveden Conservation, and Karen Teidemann-Barrett from Donald Insall Associates Architects explained to the group the various aspects of the project, from stone carving to some of the archaeological finds and techniques of the conservation.